This beautiful five-drawer chest in rich, neutral tones offers storage to meet any need, and perfectly completes the Sedona collection. 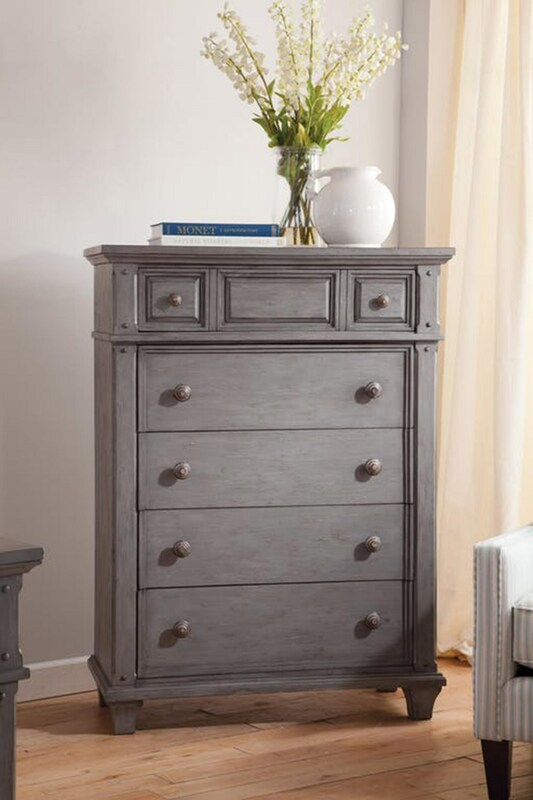 The Sedona Grey Chest by American Woodcrafters at Great American Home Store in the Memphis, TN, Southaven, MS area. Product availability may vary. Contact us for the most current availability on this product. Drawer / Shelf Construction 4-sided drawer boxes with English dovetail joinery in front and back. Felt-lined bottoms in top drawer of nightstand, dresser, and chests for storage of finer materials. Drawer interiors are finished to prevent snagging. Dust panels on the bottoms to protect the contents. Drawer Suspension Roller-bearing side guides. The inviting antiqued color of the Sedona collection from American Woodcrafters combines beautifully with the clean, sleek lines of each piece to provide a warm, homey feel. Unique moulding on the headboard and footboard add to the charm and personality of this collection. The Sedona Grey collection is a great option if you are looking for Rustic Transitional Casual furniture in the Memphis, TN, Southaven, MS area. Browse other items in the Sedona Grey collection from Great American Home Store in the Memphis, TN, Southaven, MS area.